Hello everyone! I am currently updating my space here so please bear with me while this site undergoes some much needed changes! Won't be long. 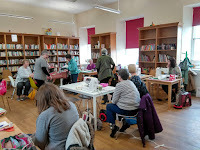 Last Saturday we had our 6th Ayrshire Modern Quilt Guild meeting at the Killie Browser. We had several new members and our large, spacious room was full of people sewing, chatting, eating cake and enjoy the joy of being brought together by the power of quilting! 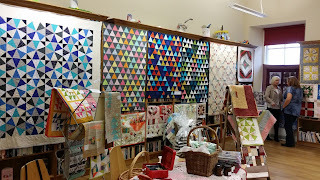 We usually have a show and tell at some point of our meeting and the work shown is always inspiring and beautiful. Linda was a new member with a beautiful quilt she was almost finished. 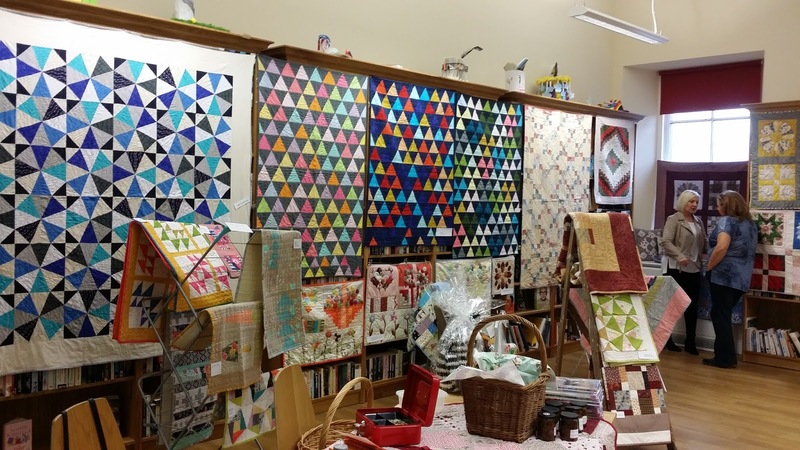 We have a great bunch of quilters of varying levels and all inspiring! 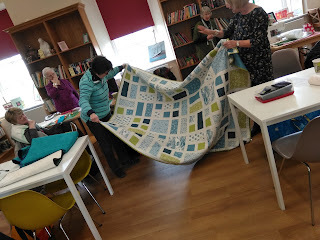 It is always fun to sew together and we felt this was a really important part of our meetings. This enables us to share tips and techniques on the spot! Can't wait for next month's meeting! Spring has sprung apparently! And yet we have snow in the UK. Thankfully it doesn't linger too much once we get into March/April months. 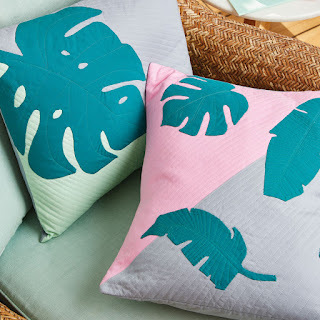 I have developed a much needed desire for greenery in the house again of late. Before the kids arrived we had a few houseplants. So I asked a friend for a cutting of her aloe vera plant and I was off! So far I have a Snake plant, young monsera, young rubber plant and a few succulents. I also rescued a rather drab looking Calathea from Morrison's and it is revived and flourishing. I must have been think botanical things several months ago when I made these cushions for Love Patchwork & Quilting magazine, issue 59. 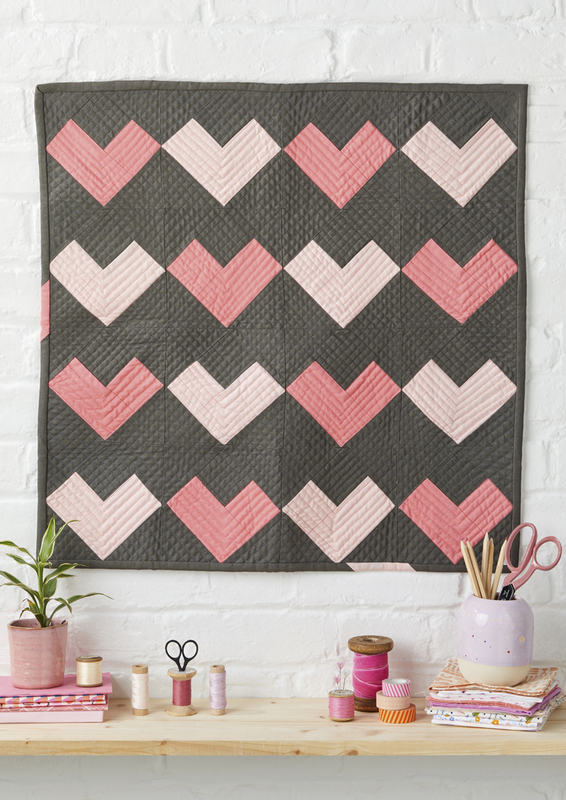 The second photo was a cute loveheart mini wall hanging I made for them too for issue 58. 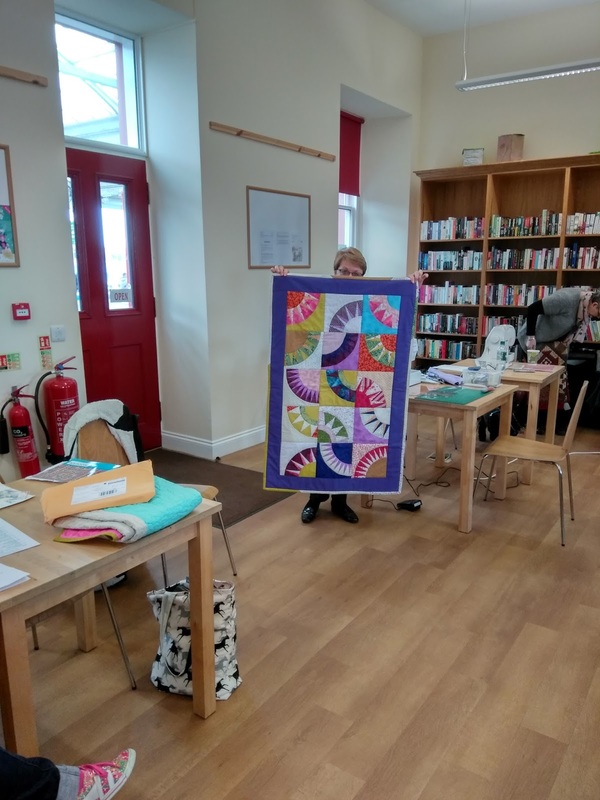 I also had a beautiful bundle of Cori Dantini fabric which I turned into a picture frame quilt for British Patchwork and Quilting. This is in their current issue. I wanted to share a few of my latest quilts featured in quilting magazine British Patchwork & Quilting. 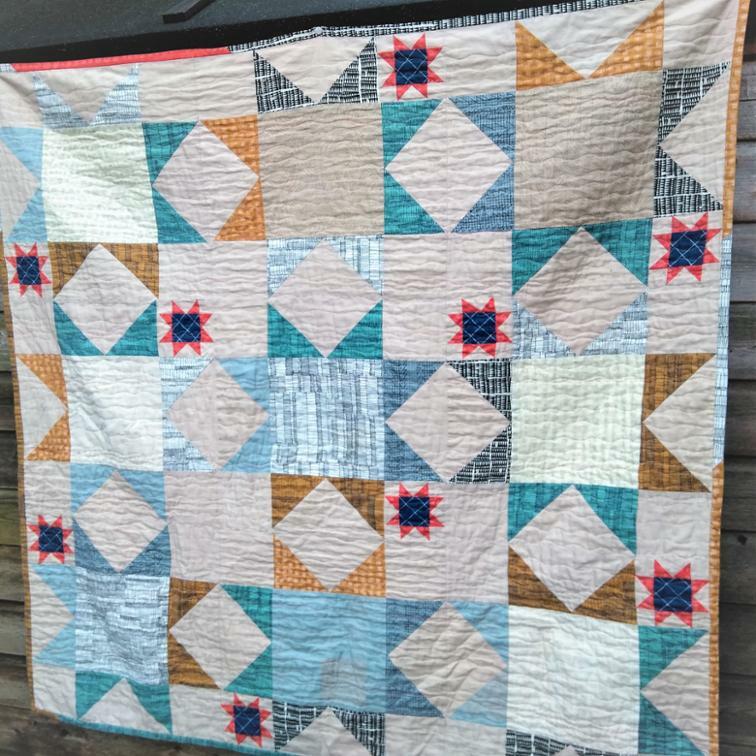 First up is my Ombre Geese quilt made with Moda Grunge fabrics. 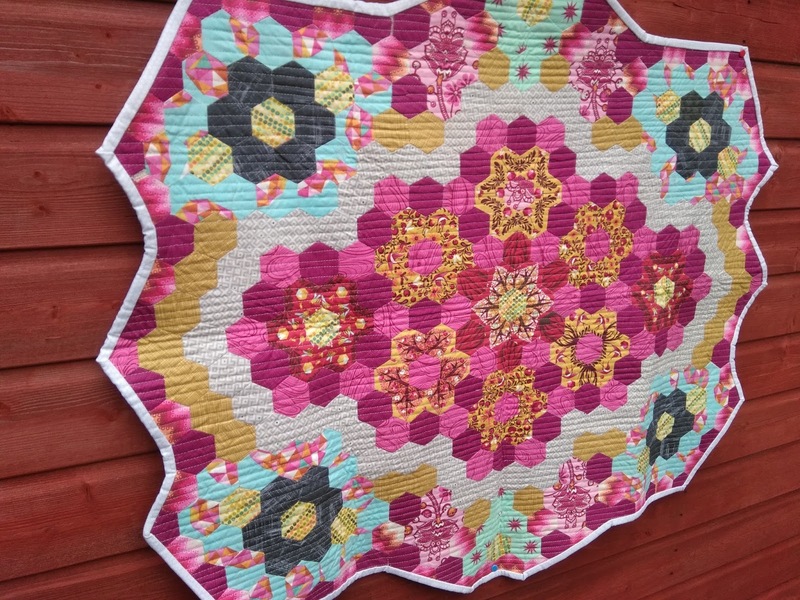 Moda Grunge is a fantastic fabric with gorgeous tones and texture on it. From a distance it looks like a kind of solid but up close it is full of the most gorgeously, grungy texture with different shades and tones. This pattern is foundation paper pieced to give those geese perfect points! 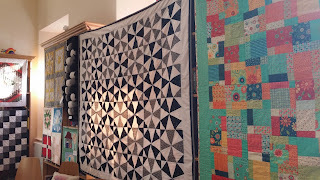 I love making this quilt and was so glad to have it back home so I could snuggle up on a sofa with it. 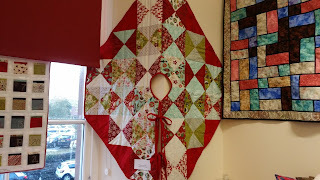 Next up was my table runner using a gorgeous jelly roll by Tilda fabrics. 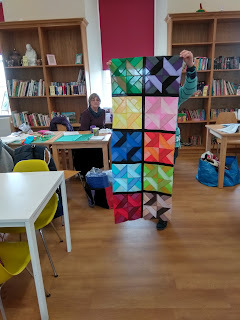 These are all co - ordinated so all I had to do was add some yarn dyed Essex linen to them. 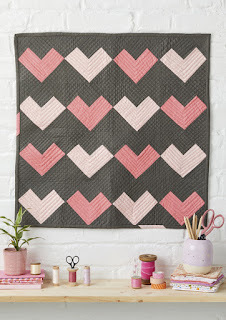 These love hearts are so cute to make and fun and I love adding some free motion quilting to this runner. Something I don't do very much! I have been busy as usual with commissions and running a home and raising a family. It never stops does it? 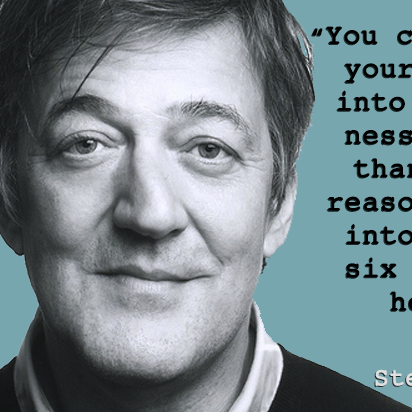 Working from home has to be one of the hardest, most disciplined things I have ever had to do. 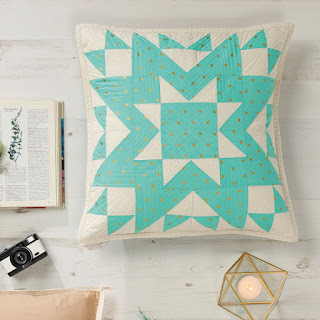 One thing I have wanted to do for a LOOOOONG while is get some of my quilt patterns into digital form for paid downloads. I finally got one done! Part of the process is getting half decent photos of the quilt itself and it has been such a grey, bleak winter here in Scotland, that this has been tricky! 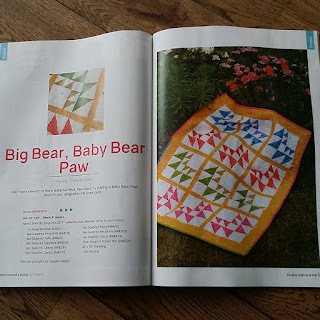 So you can find my first pdf digital download pattern available for sale on Craftsy or in my Etsy shop. 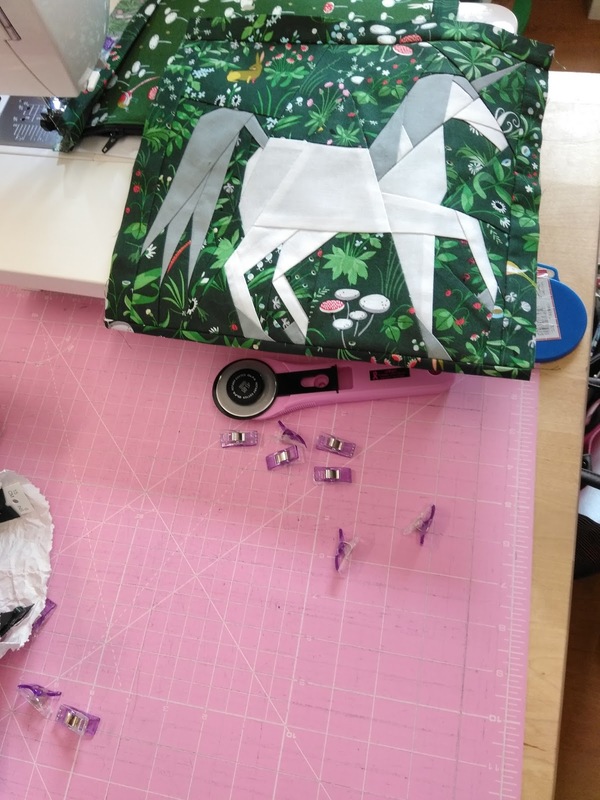 It is called Dear Doe.... as it uses the beautiful Doe fabric line by Carolyn Friedlander. The pattern has step by step instructions and diagrams to make a good lap sized quilt. 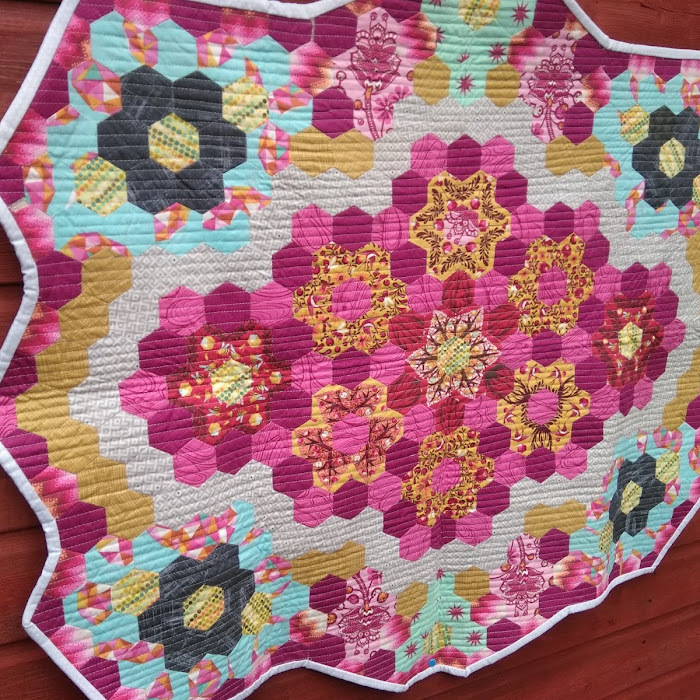 I hope you like it and I plan to release several more of my previous patterns in pdf format real soon! Well can you believe that we are approaching the end of 2017? I can't! It has flown in. I cannot believe how quickly the years fly by the older I get. 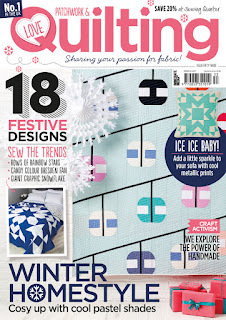 I have had a really busy year with many projects being published in beautiful quilting magazines. 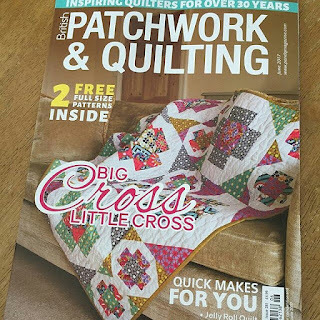 I am always amazed when a magazine editor says yes to one of my submission ideas! It still gives me that little butterfly feeling in my tummy to see the gorgeous styling and photography of the work I produce. They really do work their magic! 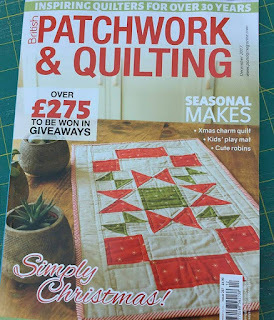 First up Love Patchwork & Quilting magazine. 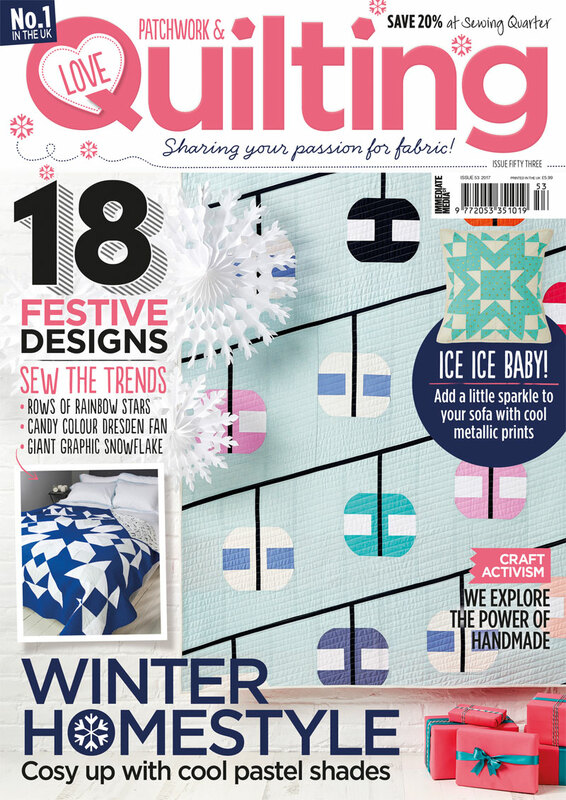 Ice Tones on the front cover. British Patchwork & Quilting cover! Keep your eyes peeled for more to come! Last year one of the students in my quilting class suggested we have a quilting exhibition of all our work and raise some money for charity. 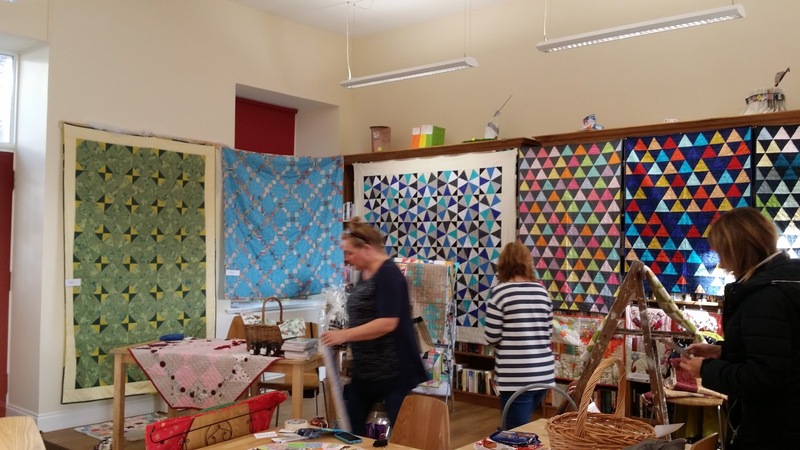 Having moved teaching venue in the last year, we decided that it was the perfect venue to hold such an event. 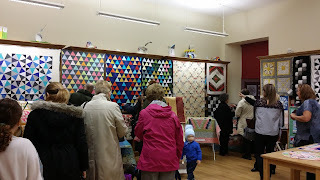 So we planned and planned and on October 25th we finally held our first ever quilting exhibition. 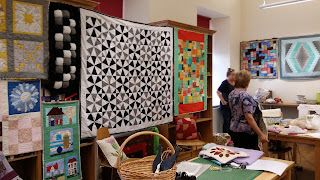 We spent all day hanging the quilts in the fabulous large space we now use for our group meet ups. 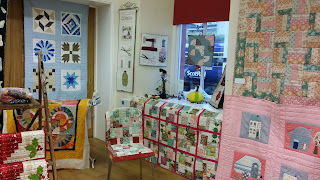 It took much longer than we thought it would to get everything organised and displayed just the way we all wanted it. 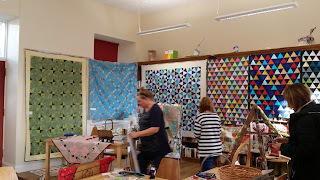 Mandy and Jenny setting up. In the midst of setting up chaos! 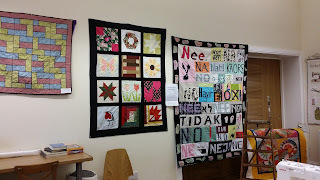 The work on display was years worth of work by the ladies I have had the honour to share my quilting skills with. 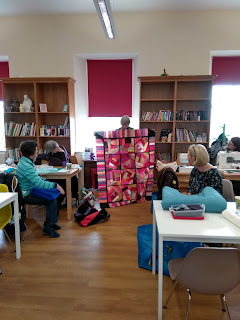 They were all total beginners and I am proud to say they are now quilters through and through. 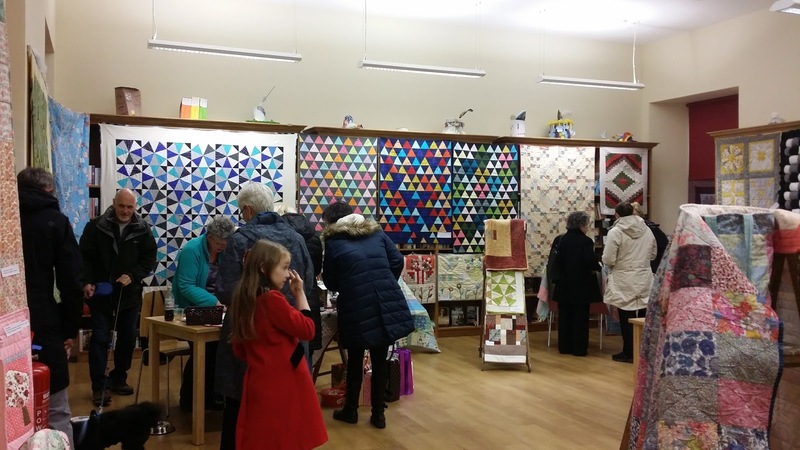 I felt like a proud mummy seeing all their beautiful work on display. 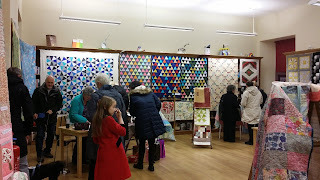 The quilt hanging on the wall was the star prize for our raffle! 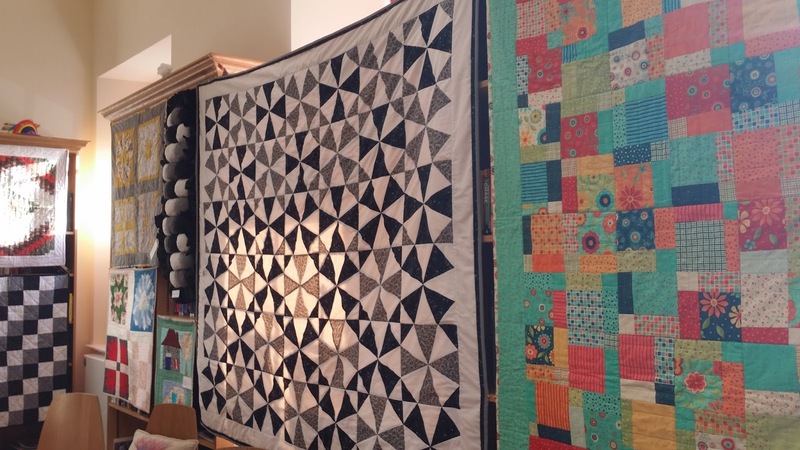 Sandra's stunning monochrome kaleidoscope quilt. 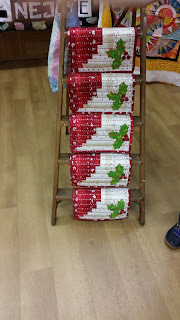 A beautiful Christmas tree skirt in the Christmas corner. Mandy's Christmas placemats got lots of attention. 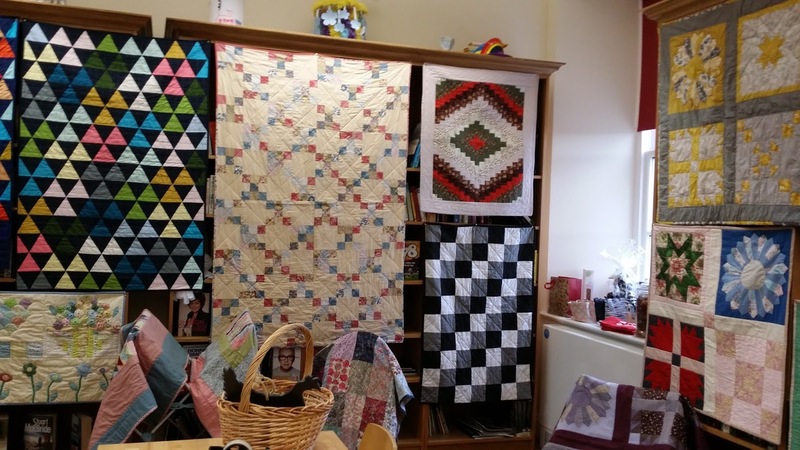 We chose to support a local charity and all funds raised were to be donated to it. We collectively chose Beautiful Inside and Out, set up by Pauline Moriaty. Pauline's beautiful eldest daughter, Jenna sadly ended her own life at age just 13. 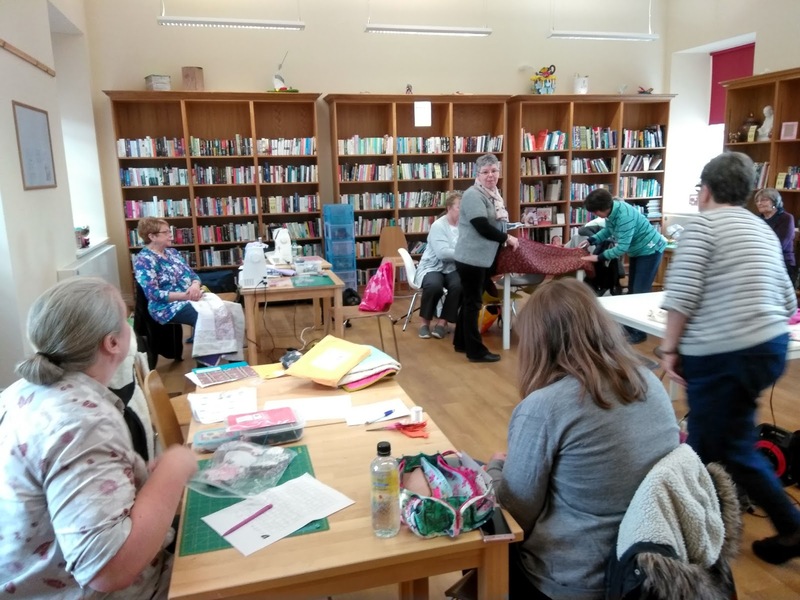 Pauline set up the charity in honour of Jenna and to provide much needed support for bereaved family and especially siblings of young people who have taken their own lives. 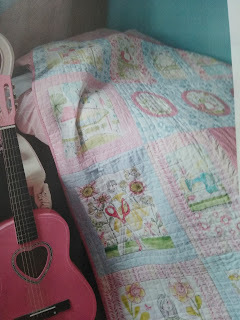 Jenna's little sister had a difficult time dealing with this and Pauline found there not to be a great deal of support available. 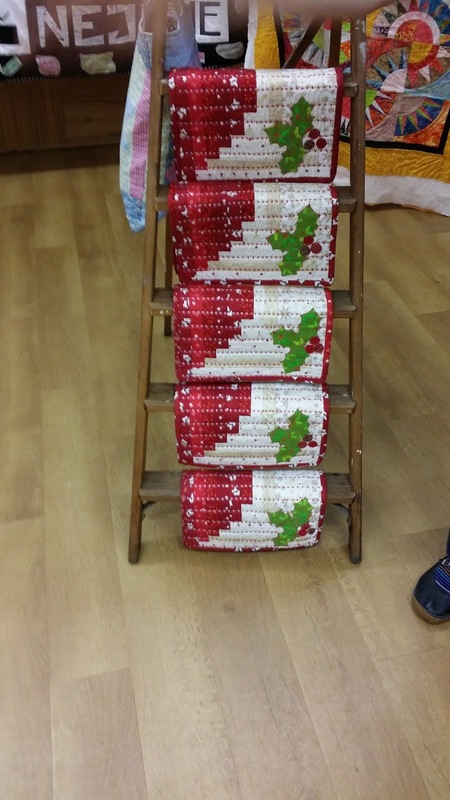 We raised over £700 for the charity!! We could not believe it! We actually thought not very many people would come, but the night exceeded all our wildest dreams! 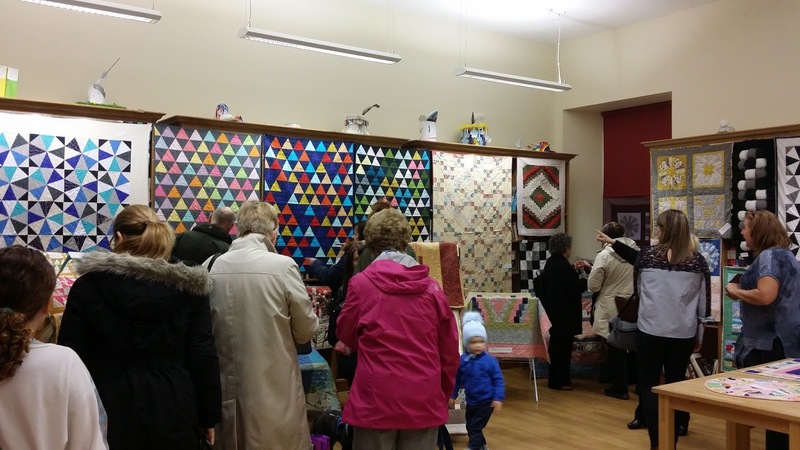 It was busy from the first 10 minutes of the doors opening and everyone enjoyed the raffle halfway through the event. 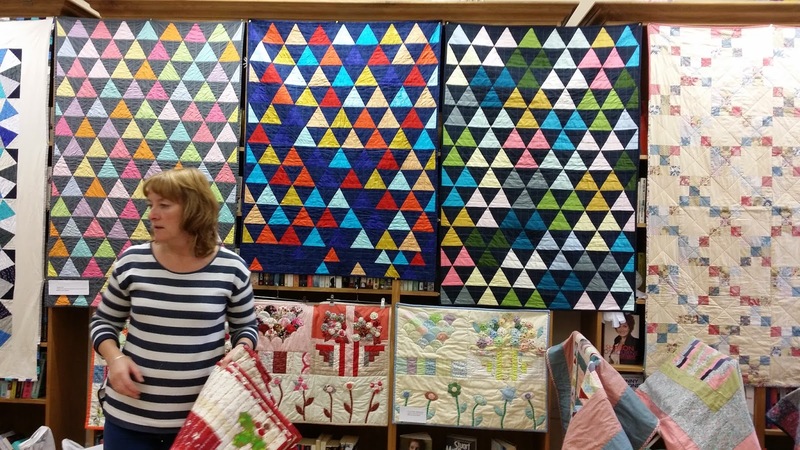 Little Sophie admiring the quilts. Young and old enjoyed the night. Pauline telling us all a little about her charity, Beautiful Inside and Out. 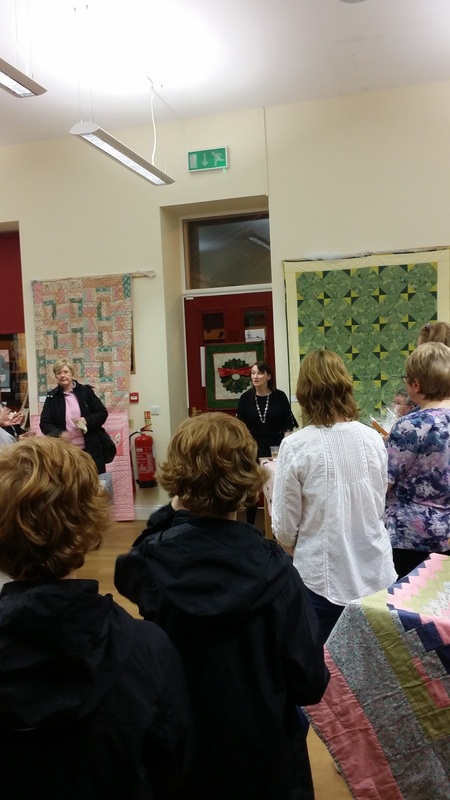 It was an honour and very humbling to be able to support Pauline's organisation. I must admit I shed a few tears after meeting her. As did a few of us. You just cannot even begin to imagine the pain and the horror of such a tragic, life changing event. 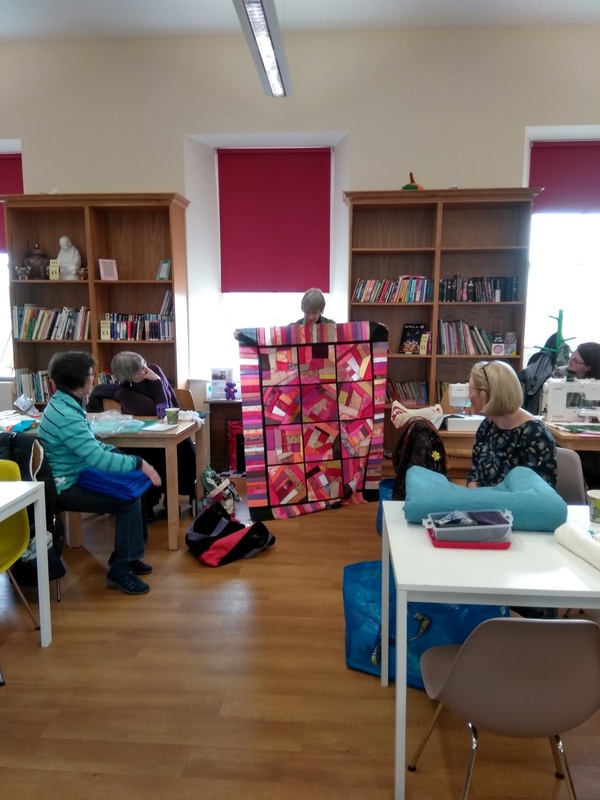 I am so pleased that we were able to help in some small way. 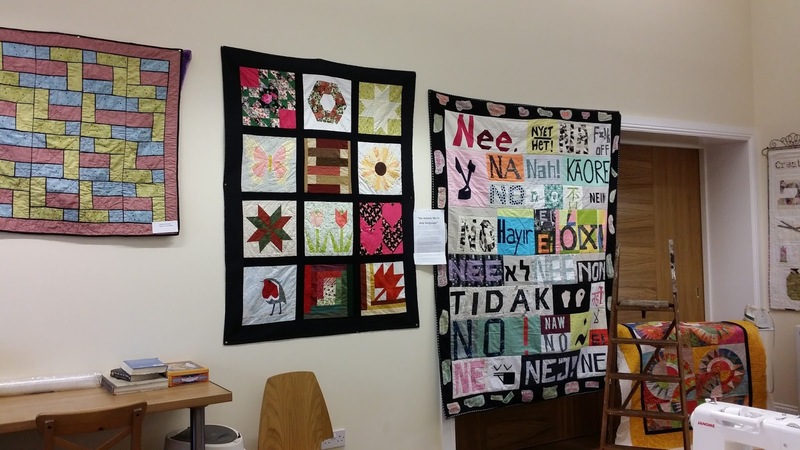 I hope you enjoyed the photos of our first quilting exhibition! 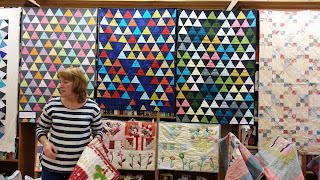 We may have another when the ladies are happy they have enough new work to show off!